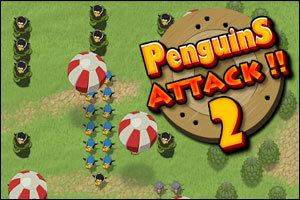 Penguins are back in Penguins Attack TD 2, the second Tower Defense game created by Jon Bartram. Penguins Attack TD 2 is bigger, better and more challenging than its predecessor: it is well worth a try. Level 3 was not well thought out. Since airplanes and balloons still travel to the back of the level and cost you lives you are forced to supply both entrance paths with adequate defenses, but there is simply not enough $ to do this. Im sure its beatable but so far is very frustrating. If the only way to beat this level is to continuously play levels 1&2 or the bonus level until upgrading enough to have the extra $ required to win that is extremely boring. Bullet tower and Flame towers. Got missile tower about 10 rounds in. Then just sell flame towers and use bullet towers to direct traffic and about 6-8 missile towers staggered towards the inside walls. Remember that upgrades cost 1/2 of the base cost – so for the missile towers, it’s rank 1: 150, rank 2: 225, rank 3: 300. In other words, you can get a R3 missile tower for the cost of 2 R1 missile towers. The R1 tower does 70 damage @ 20 rpm, the R3 does 120 @ 40 rpm. Not even factoring in the extra range, one can see R3 is 271% the efficiency of R1, for the same cost. As with most games, quality before quantity. Mike wasn’t telling you to build 8 towers before round 10, but rather before endgame. By round 10 you should have enough for 4 missile towers. Build one r3 missile in the top right of the exit square, and one r1 missile in the bottom right. When you have a little money build two basic towers, one in the top (top of the two tile walkway) and one at the bottom (bottom of THAT two tile walkway.) The r3 missile will take care of round one’s planes, and then you just upgrade and build new missile towers inside of the exit square. I beat level 4 by using a lot of basic towers to build a maze, drawing both entrances back and forth around my missile towers. I managed to beat it before getting the rank four upgrades… It’s a lot tougher than the next level, though. A bug with the helicopters appears again on level 6 as well, except it also effects planes… Any plane or helicopter that comes in on the bottom right exit appears briefly then vanishes, counting as a lost life, before any towers even have a chance to fire. By only letting through those planes and helicopters which literally couldn’t be shot at, you’re already down to five lives. I’ve tried this but I can’t seem to pass level 4 yet? what did you end up doing to pass it? I’ve got a BIG BIG bug on level six. None of the flying goons are appearing on the right hand side… so I can’t shoot ’em down, but the game still thinks that they are there so it keeps eating up my lives. I had some other bugginess with flying goons on other levels (flying along the edges instead of down the main path) so I was still able to set up to shoot them down. I’ve built towers all over in hopes it might recognize something to shoot at but they simply do not register anything there (nor do I see anything FYI) but then my lives will go down by the amount of planes, helis, balloons that should have been there and at the time it would have taken to cross the screen and across the exit line. I can’t beat the level as a result. Tried all sorts of work arounds. Sure you can. The helis are moving above the screen edge. Put a maxed 100$ tower or two directly to the right of the top entrance. Missiles won’t work for some reason. Loads of bugs in this one. The game claims to go to Level 12 in the Achievements, but only up to Level 8 is displayed. On another site I loaded the game and could see Level 9 to the right of the screen but when you try to play it the game screen is all gray and nothing works. Level 14 through 20 are displayed locked, but no 10 to 13. Achievements stop recording after level 6. I defeated the boss twice in level 3 and it wasn’t recorded. Sometimes when you beat a level it doesn’t end, it’s just keeps going and going, releasing waves with no enemies and no victory prompt comes up. And Motar Tower is all screwed up, completely useless. Level 3 is a matter of putting full power on the top side. Build 2 $100 turret towers with 2 star. Then make a path just at the entrance with the $10 tower going all the way up to meet with the $100 tower. There will be air balloons and planes coming from top and bottom. So later build 2 $100 tower at the bottom and upgrade them to 4 star. That should keep them out for a while. Meanwhile the top end keep you need to slow them down a little. Forget about the plasma. Just the Missile launcher will do. Place them strategically. 9th Weapon is the Laser Tower: Damage=190, Range=160, and Rate of Fire=80. Needless to say. Its pretty sick with 4 star upgrade. did you get to play level 12? i’m working up my way to it right now. does it require certain amount of exp? How do you open level 12? I have perfect on everthing on the first 11!? It takes a LOT, I suspect. I’m player level 16, with every achievement below Level 12. It tells me I need 54034 player exp to get to the next level (I have 87586, so 141620 appears to be required). Yeah I can’t get total extinction on levels 4 and 6 due to bugs. On level 4, planes fly by across top right instead of down the middle while on level 6, fliers are “invisible” on the right side. Any ways to get 100% clear with the bugs or impossible? any wise man knows how to use weapon level 8? (the throwing thing that always miss the target?) Thanks in advance!!! Edit: the latest version is now available on FreeGamesNews server. i have advanced to level 18 player, but yet level 12 is locked. unlocked level 5 upgrades for weapons. Is there really 15 towers you can unlock? There’s enough space for 15 but it would take forever to unlock them all..
ok heres the deal… i have beat every level except the last bonus level. so far i have 9 towers i want to know if anyone has unlocked the last bonus level. it is taking me forever…. You need to get to level 19 to unlock the last level, about 410,000 total exp. You can beat every level with just $10 towers. If you get the level 5 upgrades, you can beat every level at 100% with just $10 towers. I beat level 6 with just level 4 upgrades. That’s the thing, it takes so long to get through the higher levels that you try things like getting 100% with just bullet towers…. There is no tenth weapon. I got all the way to level 31, and all it does is add $50 for each additional level after 19. I can’t beleive that there is no tenth weapon!! Im halfway through level 17… I dont even see the point of going any further. so at level 18 you get 5 upgrades, and level 19 you get the Last board unlocked right? I tried to see if I could beat level 7 with just 10 dollar towers at level 1. I decided it was theoretically possible but took too long. The problem is the healers heal faster than they can take damage. I did the previous levels but Cross Roads is still locked…do I have to do something special ? like clear all levels or something ? I got thru levels 1 to 8 plus the first three bonus levels with 100% killed using basic turrets and 3x upgraded missle turrets. It’s ridiculous to leave the last level locked until one reaches 410,000 xp. I only have 81,474 now and I’ll be d***ed if I’m gonna play 5x that much just to unlock a level. So for me, that’s a wrap. Basic turrets form a maze requiring penguins to travel the longest route possible. Figure out the coverage range of your highest upgrade for missle turrets (or flak towers until you get them) and strategically position them to cover as much of the map as possible. On some maps you might be better off not covering the entire map with the maze assuming upgraded missles will prevent them from getting beyond a certain point. Look at your first wave and see if there are planes coming in first. If so, you need missle turrets before you press the Send button. Note if the planes come out of one entrance, the other, or both, then if you fail, you can concentrate on that area of coverage for the next try. Easy strategy for most levels, once 4-star upgrades are available: Create funnel to get bad guys into single file. Then create a large “S” they need to travel through. Start the “S” with basic turrets, upgrading to anti-air cannons with a few slow turrets. By the time you’re near the end of the level, you should have 10-12 4-star anti-air, all with overlapping fire. Almost every level is easily beatable with this strategy. Has anybody else seen thire XP decrease on occasion? I played a level particularly efficiently (total extinction, boss killed) using a minimum of towers but saw my XP decrease significantly. What gives?